If you're considering adopting a pair, please consider these especially-bonded pairs below, although this list is not meant to be exhaustive. Many of our other kitties shown on our BOYS or GIRLS pages are in homes with multiple fosters and can be paired up with one of their many playmates. So if you don't see what you're looking for on this page, be sure to give us a call and ask our adoption counselors about other "mix 'n match" pairs that we have. “A long time ago in a galaxy far, far away...”, Yoda was on a journey to find his forever home. This Yoda has lots of energy, is engaging and very interactive. And, he loves to be pet behind his ears (which are not even close to the size of the ears of the Yoda you know)! This Yoda is new to the RESCUE UNIVERSE. As he landed on the new planet Foster, his sweet nature won everyone over in a short time. He is very affectionate and loves to sit in laps and play with his warrior sibling. Behaviorally and socially, it’s best to adopt kittens in pairs, or into a home with a playful cat. Yoda really needs a playmate in his forever home…and then they can get to play, and snuggle while you're not home. Check out our website to see if one of his siblings is still available. If there is already another playful cat or kitten in your house, that would work out too…he already proved he is great at making friends! If you are only interested in adopting a single kitten, and you’re home most of the day, and able to spend interactive time with a kitten, we will consider adopting out a kitten older than 4 months. Each foster home knows the kitten’s personalities best, and we follow their recommendations for single placements. Yoda’s foster family currently recommends that he not be adopted as a single cat. Yoda’s estimated date of birth is 9/22/15. His adoption fee of $135 includes his vet exam, FVRCP vaccinations, FIV & Feline Leukemia testing (neg), routine deworming, flea control, microchip and neuter. 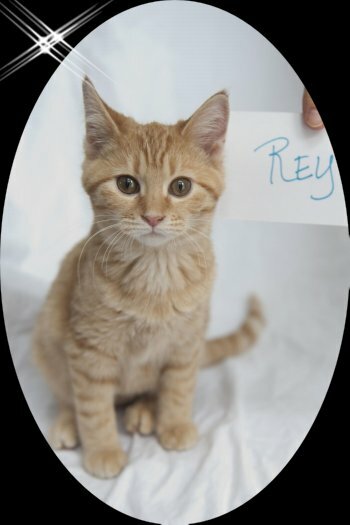 “A long time ago in a galaxy far, far away...”, Rey was on a journey to find her forever home. She made it to the RESCUE UNIVERSE by always exploring to find her way. As she landed on the new planet Foster, her sweet and gentle nature won the other native felines over with no problem! Now that she is here, she makes time to play while keeping up with her explorations of this new land. This girl definitely knows how to have fun! In her new foster home, she is always looking around the house, and learning the ways of the humans. 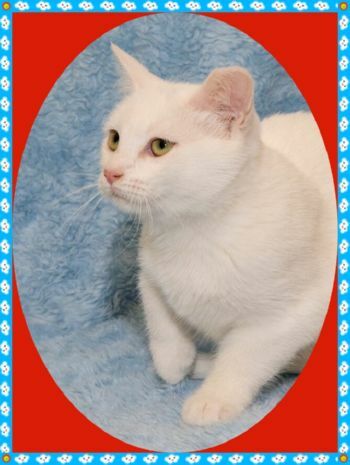 She is very affectionate with her human friends, a lap cat in training, and loves to play with her warrior sibling. Rey will be an interactive and fun friend for life. Behaviorally and socially, it’s best to adopt kittens in pairs, or into a home with a playful cat. Rey really needs a playmate in her forever home…and then they can get to play, and snuggle while you're not home. Check out our website to see if one of her siblings is still available. If there is already another playful cat or kitten in your house, that would work out too…she already proved she is great at making friends! If you are only interested in adopting a single kitten, and you’re home most of the day, and able to spend interactive time with a kitten, we will consider adopting out a kitten older than 4 months. Each foster home knows the kitten’s personalities best, and we follow their recommendations for single placements. Rey’s foster family currently recommends that she not be adopted as a single cat. Rey’s estimated date of birth is 9/22/15. Her adoption fee of $135 includes her vet exam, FVRCP vaccinations, FIV & Feline Leukemia testing (neg), routine deworming, flea control, microchip and spay. “A long time ago in a galaxy far, far away...”, Finn was on a journey to find his forever home. He made it to the RESCUE UNIVERSE by being brave and smart to find his way into the world of “big people”. As he landed on the new planet Foster, he continued to be curious to see what’s going on and to make sure he’s a part of it! Finn is a great companion to his siblings and to every human he meets. Finn will be a lifelong friend! Behaviorally and socially, it’s best to adopt kittens in pairs, or into a home with a playful cat. Finn really needs a playmate in his forever home…and then they can get to play, and snuggle while you're not home. Check out our website to see if one of his siblings is still available. If there is already another playful cat or kitten in your house, that would work out too…he already proved he is great at making friends! If you are only interested in adopting a single kitten, and you’re home most of the day, and able to spend interactive time with a kitten, we will consider adopting out a kitten older than 4 months. Each foster home knows the kitten’s personalities best, and we follow their recommendations for single placements. Finn’s foster family currently recommends that he not be adopted as a single cat. Finn’s estimated date of birth is 9/22/15. His adoption fee of $135 includes his vet exam, FVRCP vaccinations, FIV & Feline Leukemia testing (neg), routine deworming, flea control, microchip and neuter. “A long time ago in a galaxy far, far away...”, Maz was on a journey to find her forever home. She followed the path of her siblings and safely arrived in the RESCUE UNIVERSE. As she landed on the new planet Foster, Maz showed he foster humans that she is very polite, doesn’t instigate any rough-housing, but always joins in on the fun. She’s actually very princess-like. Behaviorally and socially, it’s best to adopt kittens in pairs, or into a home with a playful cat. Maz really needs a playmate in her forever home…and then they can get to play, and snuggle while you're not home. Check out our website to see if one of her siblings is still available. If there is already another playful cat or kitten in your house, that would work out too…she already proved she is great at making friends! If you are only interested in adopting a single kitten, and you’re home most of the day, and able to spend interactive time with a kitten, we will consider adopting out a kitten older than 4 months. Each foster home knows the kitten’s personalities best, and we follow their recommendations for single placements. Maz’s foster family currently recommends that she not be adopted as a single cat. Maz’s estimated date of birth is 9/22/15. Her adoption fee of $135 includes her vet exam, FVRCP vaccinations, FIV & Feline Leukemia testing (neg), routine deworming, flea control, microchip and spay. “A long time ago in a galaxy far, far away...”, Padme was on a journey to find her forever home. She made it to the RESCUE UNIVERSE. As she landed on the new planet Foster, she knows it won’t take her long to complete her journey because she is such a sweet kitten! She knows exactly how to warm up your heart by curling up in your lap and having you pet her until she falls asleep. Padme will be hard to resist! Behaviorally and socially, it’s best to adopt kittens in pairs, or into a home with a playful cat. Padme really needs a playmate in her forever home…and then they can get to play, and snuggle while you're not home. Check out our website to see if one of her siblings is still available. If there is already another playful cat or kitten in your house, that would work out too…she already proved she is great at making friends! If you are only interested in adopting a single kitten, and you’re home most of the day, and able to spend interactive time with a kitten, we will consider adopting out a kitten older than 4 months. Each foster home knows the kitten’s personalities best, and we follow their recommendations for single placements. Padme’s foster family currently recommends that she not be adopted as a single cat. Padme’s estimated date of birth is 9/22/15. Her adoption fee of $135 includes her vet exam, FVRCP vaccinations, FIV & Feline Leukemia testing (neg), routine deworming, flea control, microchip and spay. ANYONE UP FOR A GAME OF BRIDGE? BRIDGE came to us with her four kittens. She was a wonderful mom to her babies, and now they are old enough to be on their own and are up for adoption too. Bridge settled into her new foster home very quickly. She is very vocal and loves to sit on your lap, purring contently. It does not bother her at all, but Bridge does not have vision in her right eye. She has an "Iris bombe", which occurs when there is an adhesion between the iris and the lens of the eye. Her left eye is completely normal. Bridge is a super sweet and friendly young cat and is now looking for a forever home with someone who will take good care of her! Bridge really gets along well with her kids, if you’d consider keeping part of the family together. We also think she would do fine as a single cat, or if there is already another playful cat or kitten in your house, that would work out too…she already proved he is great at making friends! Bridges’ estimated date of birth is 1/5/15. 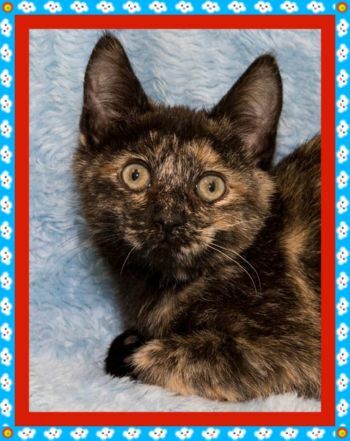 Her adoption fee of $95 includes her vet exam, FVRCP vaccinations, FIV & Feline Leukemia testing (neg), routine deworming, flea control, microchip and spay. ANYONE UP FOR A GAME OF RUMMY? RUMMY is a very handsome guy, who was a bit shy after all the changes from moving around in his young life. Rummy received some special one-on-one time, and in less than 2 weeks he regained his confidence that these new humans are GREAT! Rummy is now ready to find his forever home! He can still be a bit shy at times, but LOVES to be pet. Right now, he likes to be held for only a short time, then wants to get his feet back on the floor. He loves to play with toys, especially bigger dog toys that he can carry around! Rummy is also a talker if you’re looking for someone to have a conversation with! 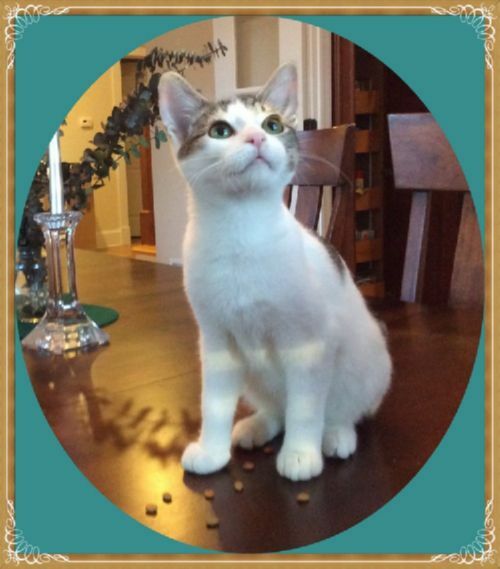 Rummy loves playing with his siblings, and would love to be adopted with one of them. We told him that pretty soon he won’t have any more changes in his life…he can settle down in his forever home! Behaviorally and socially, it’s best to adopt kittens in pairs, or into a home with a playful cat. Rummy really needs a playmate in his forever home…and then they can get to play, and snuggle while you're not home. Check out our website to see if one of his siblings is still available. If there is already another playful cat or kitten in your house, that would work out too…he already proved he is great at making friends! If you are only interested in adopting a single kitten, and you’re home most of the day, and able to spend interactive time with a kitten, we will consider adopting out a kitten older than 4 months. Each foster home knows the kitten’s personalities best, and we follow their recommendations for single placements. Rummy’s foster family currently recommends that he not be adopted as a single cat. Rummy’s estimated date of birth is 9/15/15. His adoption fee of $135 includes his vet exam, FVRCP vaccinations, FIV & Feline Leukemia testing (neg), routine deworming, flea control, microchip and neuter. ANYONE UP FOR A GAME OF PINOCHLE? 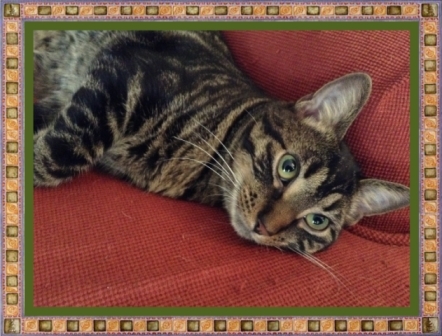 PINOCHLE is a typical “wild and crazy” little boy. He and his siblings love playing and chasing each other around all day long. Any match of siblings would be a perfect pair to be adopted together to keep you entertained with their kitten antics. Pinochle has thick, cuddly fur and is very vocal. He is new to Adopt-a-Pet, so stay tuned for updates. Behaviorally and socially, it’s best to adopt kittens in pairs, or into a home with a playful cat. Pinochle really needs a playmate in his forever home…and then they can get to play, and snuggle while you're not home. Check out our website to see if one of his siblings is still available. If there is already another playful cat or kitten in your house, that would work out too…he already proved he is great at making friends! If you are only interested in adopting a single kitten, and you’re home most of the day, and able to spend interactive time with a kitten, we will consider adopting out a kitten older than 4 months. Each foster home knows the kitten’s personalities best, and we follow their recommendations for single placements. Pinochle’s foster family currently recommends that he not be adopted as a single cat. Pinochle’s estimated date of birth is 9/15/15. His adoption fee of $135 includes his vet exam, FVRCP vaccinations, FIV & Feline Leukemia testing (neg), routine deworming, flea control, microchip and neuter. ANYONE UP FOR A GAME OF POKER? 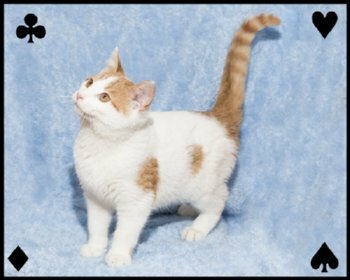 POKER is mostly white with beautiful orange tabby markings on his head and tail with thick fur, which might look like baby fat. But, he is not really chubby at all because he plays and wrestles with his siblings every waking moment. 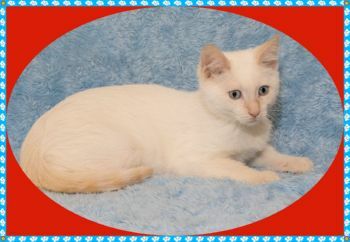 Any of the siblings would make a perfect pair to be adopted together to keep you entertained with their kitten antics. Poker is new to Adopt-a-Pet, so we will post updates as we get to know him better. Behaviorally and socially, it’s best to adopt kittens in pairs, or into a home with a playful cat. Poker really needs a playmate in his forever home…and then they can get to play, and snuggle while you're not home. Check out our website to see if one of his siblings is still available. If there is already another playful cat or kitten in your house, that would work out too…he already proved he is great at making friends! If you are only interested in adopting a single kitten, and you’re home most of the day, and able to spend interactive time with a kitten, we will consider adopting out a kitten older than 4 months. 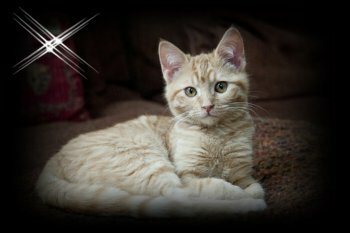 Each foster home knows the kitten’s personalities best, and we follow their recommendations for single placements. Poker’s foster family currently recommends that he not be adopted as a single cat. You can meet Poker at Wilmette Pet, 625 Green Bay Road, anytime during store hours 7 days a week. (847-251-6750 www.wilmettepetcenter.com). Although you may want to adopt her on the spot, please know that you will have to go through the application process first. Poker’s estimated date of birth is 9/15/15. His adoption fee of $135 includes his vet exam, FVRCP vaccinations, FIV & Feline Leukemia testing (neg), routine deworming, flea control, microchip and neuter. ANYONE UP FOR A GAME OF HEARTS? HEARTS is a new arrival to Adopt-a-Pet, so we don't know too much about her yet, except that she settled into her new foster home very quickly. She loves sitting on your lap. She might look a little chubby, but it’s only her fur that is very thick. Stay tuned for more information about her -- if this super friendly girl stays with us long enough. Behaviorally and socially, it’s best to adopt kittens in pairs, or into a home with a playful cat. Hearts really needs a playmate in her forever home…and then they can get to play, and snuggle while you're not home. Check out our website to see if one of her siblings is still available. If there is already another playful cat or kitten in your house, that would work out too…she already proved he is great at making friends! If you are only interested in adopting a single kitten, and you’re home most of the day, and able to spend interactive time with a kitten, we will consider adopting out a kitten older than 4 months. Each foster home knows the kitten’s personalities best, and we follow their recommendations for single placements. Hearts’ foster family currently recommends that she not be adopted as a single cat. You can meet Hearts at Wilmette Pet, 625 Green Bay Road, anytime during store hours 7 days a week. 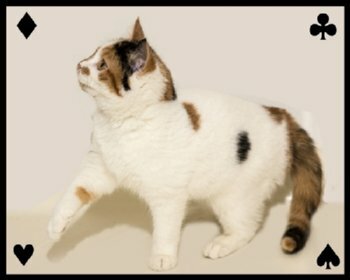 (847-251-6750 www.wilmettepetcenter.com). Although you may want to adopt her on the spot, please know that you will have to go through the application process first. Hearts’ estimated date of birth is 9/15/15. Her adoption fee of $135 includes her vet exam, FVRCP vaccinations, FIV & Feline Leukemia testing (neg), routine deworming, flea control, microchip and spay. and I am wonderful :)! Could you please take me home? then they can play and snuggle while you're not home. Check out our Pick A Pair page to see if one of her foster buddies are still available. proved she is great at making friends! for single placements – in Arwen’s case, she cannot be the only cat in the house. vaccination, FIV & Feline Leukemia testing (neg), routine deworming, flea control, microchip and spay. been around little kids but would probably be ok with older respectful kids who aren't going to chase me when I'm sitting quietly on the couch. cat but I could learn to be one if you spend a lot of time with me. out too…she already proved she is great at making friends! spend with her every day. routine deworming, flea control, microchip and spay. young kitten when I was rescued, so I am kind of shy. I really really want to trust people and not be a scaredy kitty, but it's hard for me. while I adjust to my new environment and get to know you. making friends! 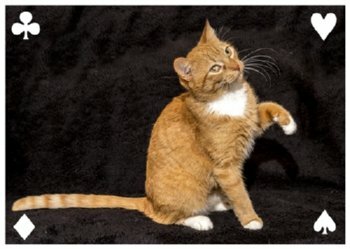 With Pauly’s personality, he should be placed with an outgoing, non-shy, cat. placements. 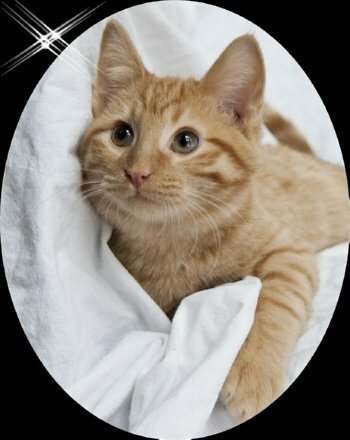 Per Pauly’s foster mom, he is independent enough to be adopted as a single kitten. routine deworming, flea control, microchip and neuter. as they don't chase me. I would be fine as a single cat but would much rather go with a kitten buddy. How about my sister?! would work out too…he already proved he is great at making friends! time to spend with him every day. (neg), routine deworming, flea control, microchip and neuter. whenever you come home! This little orange pumpkin is looking for a home for the holidays! adopted with his sister, Orangina, since they are quite bonded. all… she and her brother run to meet you at the door whenever you come home! adopted with her brother, Maki since they are quite bonded. few gold medals by now. If you have an open heart, and a toy or two, Jinx would be thrilled to go to a forever home with you. foster home with his sister Juliette. 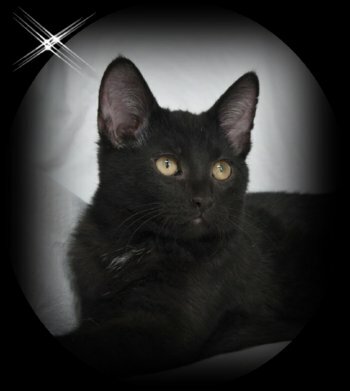 Jinx could be adopted with his sister, or any other playful cat or kitten. 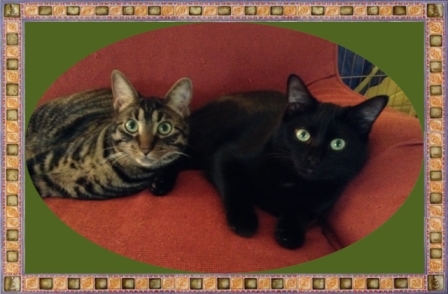 You can meet Jinx and Juliette at Wilmette Pet, 625 Green Bay Road, anytime during store hours 7 days a week. (847-251-6750 www.wilmettepetcenter.com). Although you may want to adopt them on the spot, please know that you will have to go through the application process first. make her a very happy kitten. Juliette can always find her way onto your lap. Just like she's hoping to find a place is your heart. foster home with her brother Jinx. Juliette could be adopted with her brother, or any other playful cat or kitten. 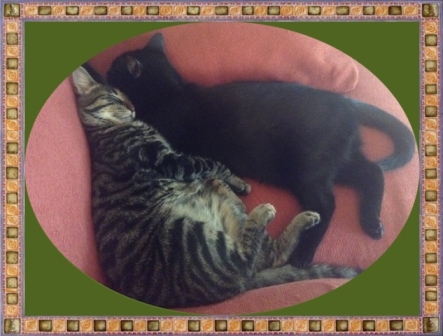 You can meet Juliette and Jinx at Wilmette Pet, 625 Green Bay Road, anytime during store hours 7 days a week. (847-251-6750 www.wilmettepetcenter.com). Although you may want to adopt them on the spot, please know that you will have to go through the application process first. (neg), routine deworming, flea control, microchip and spay. GO HAWKS! Our Kaner is a furry version of a Chicago Blackhawk! Kaner LOVES to explore and play with his siblings! One of his favorite things to do is to chase a laser mouse! He also seems to have an attraction to golf balls (I guess hockey pucks aren’t so easy to push around for a cat). Kaner also comes when called, and if he is sleeping somewhere, a rattle of the food bag will bring him right to you! Kaner is shy with new people, but once he gets to know you, he will seek attention. He has cuddled on his foster mom’s lap, and slept next to her on the bed. Kaner prefers to not be picked up by anyone, but will roll over for a gentle belly rub. He is also very gentle with taking treats from your fingers. Kaner has been in a foster home with children, other cats and dogs. Even with the children being respectful, he is definitely more trusting of adults. He enjoyed interacting with the resident cats, and peacefully co-existed with the dogs J. If you have patience to warm his heart, and gain his trust, he will fill your home with gratitude and warm your heart. It takes a special person to gain the confidence of a shy cat. When a shy cat is moved to a new environment, he will have to start all over to gain the trust of his new family. Interactions with a shy cat will be slow. Initially placing him in a room of his own would be ideal. You will most likely need to make frequent visits to his new room, just sit in a chair or lie on the floor and just talk to him, letting him get to know your voice. Little by little, he will start to get closer and want to be pet. He needs time to learn to trust you. You will need to let him come to you at his own pace. You will need to only pet him when he wants to be petted, and let him walk away if he feels scared. This process could take a week, two weeks, or even months. We will help with this process by providing information to help with the transition. Behaviorally and socially, it’s best to adopt kittens in pairs, or into a home with a playful cat. Kaner would really like a playmate in his forever home…and then they can get to play, and snuggle while you're not home. Check out our Pick A Pair page to see if one of his siblings is still available! If there is already another playful cat or kitten in your house, that would work out too…he already proved he is great at making friends! Kaner’s estimated date of birth is 9/8/14. His adoption fee of $50 includes: his exam, FVRCP vaccinations, FIV & Feline Leukemia testing (neg), routine deworming, flea control, microchip and neuter. Please meet the furry version of a Chicago Blackhawk! This is Toews, the captain of his litter J! 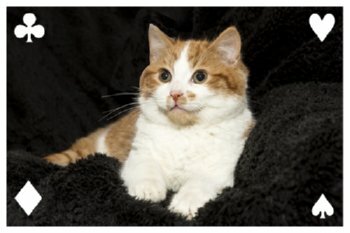 Toews and his littermates were found as strays in a northwest suburb when they were over 2 months old and completely scared since humans had never been a part of their lives. Toews has been receiving lots of love in his foster home, and has turned into a very sweet affectionate boy. He was the first one of his litter to be ready for his forever home, the leader of the pack. 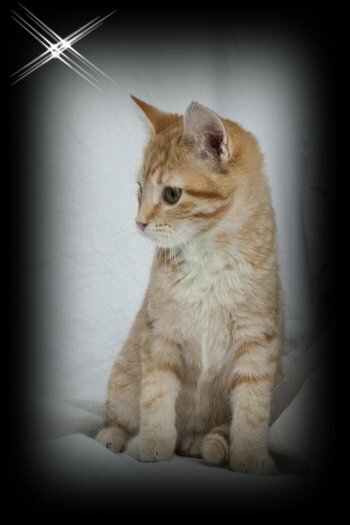 He is a typical kitten, ready to play and explore, and when he is ready to settle in, he seeks attention and will climb on your lap. One of his favorite things to do right now is to tap his nose on his foster mom’s nose…just his cute way to show affection. 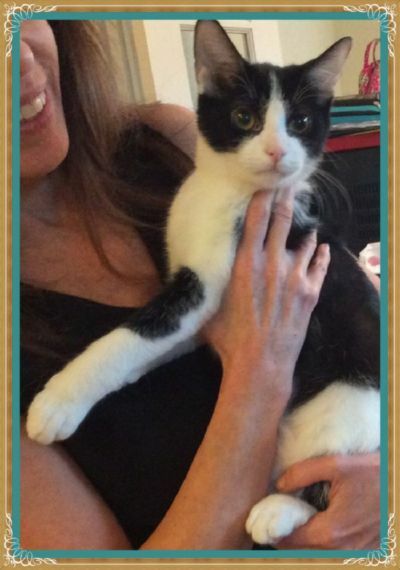 Toews has been in a foster home with children, other cats and respectful dogs J. Although he allows the children to pet him, he does not want them to pick him up. He is more trusting of adults. Toews is shy with new people, but once he gets to know you, he will be a total love! He will seek attention, cuddle on your lap, allow you to pick him up, and purr away to let you know he is happy. It takes a special person to gain the confidence of a shy cat. When a shy cat is moved to a new environment, he will have to start all over to gain the trust of his new family. Interactions with a shy cat will be slow. Initially placing him in a room of his own would be ideal. You will most likely need to make frequent visits to his new room, just sit in a chair or lie on the floor and just talk to him, letting him get to know your voice. Little by little, he will start to get closer and want to be pet. He needs time to learn to trust you. You will need to let him come to you at his own pace. You will need to only pet him when he wants to be petted, and let him walk away if he feels scared. This process could take a week, two weeks, or even months. We will help with this process by providing information to help with the transition. If you possess the patience to warm his heart, and gain his trust, he will fill your home with gratitude and warm your heart! Behaviorally and socially, it’s best to adopt kittens in pairs, or into a home with a playful cat. Toews would really like a playmate in his forever home…and then they can get to play, and snuggle while you're not home. Check out our Pick A Pair page to see if one of his siblings is still available…he especially likes to play with his brother, but cuddle with his sister! If there is already another playful cat or kitten in your house, that would work out too…he already proved he is great at making friends! Toews’estimated date of birth is 9/8/14. His adoption fee of $50 includes his vet exam, FVRCP vaccinations, FIV & Feline Leukemia testing (neg) routine deworming, flea control, microchip and neuter. 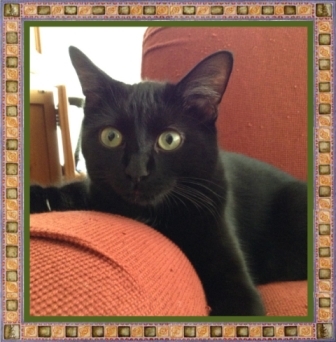 Cinnamon is a small black cat with beautiful green eyes and a sweet temperament. He was the smallest of his litter, but quickly caught up and now rules the roost in his foster home :)! He loves to play with his brother, and is always curious to see what you are doing. He even gets along well with the small dogs in his foster home. Cinnamon has a tiny voice and unlike his brother, you'll rarely hear a word from him. Cinnamon was recently diagnosed with the early stages of Asthma and requires daily medicine, and low-dust litter to manage his condition. Cinnamon is also on a special strict diet of “Iams Kitten Chicken food”. Cinnamon’s date of birth is 11/26/13. Cinnamon is very close to his brother, Pepper, and since they are truly a bonded pair, they must be adopted together. 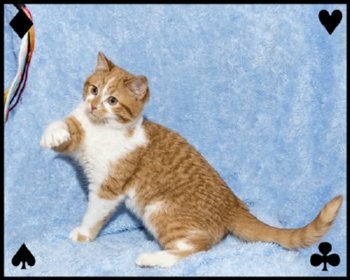 Their combined adoption fee is $150 and includes: vet exam, feline leukemia/FIV test (neg), FVRCP (distemper combo) vaccination, rabies vaccination, routine deworming, flea preventative, microchip and neuter. 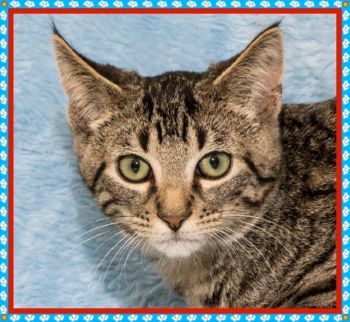 Pepper is a sweet, shy tabby with gorgeous green eyes! He is very chatty one-on-one, but can be nervous in a crowd. He loves kids, but only in small, quiet groups. Once he is comfortable with his surroundings, he is quick to purr and play. He adores his brother, Cinnamon, and the two stick close together. He loves watching birds and chipmunks out the window and will cuddle up for a nap. Pepper’s date of birth is 11/26/13. Pepper is very close to his brother, Cinnamon, and since they are truly a bonded pair, they must be adopted together. Their combined adoption fee is $150 and includes: vet exam, feline leukemia/FIV test (neg), FVRCP (distemper combo) vaccination, rabies vaccination, routine deworming, flea preventative, microchip and neuter.